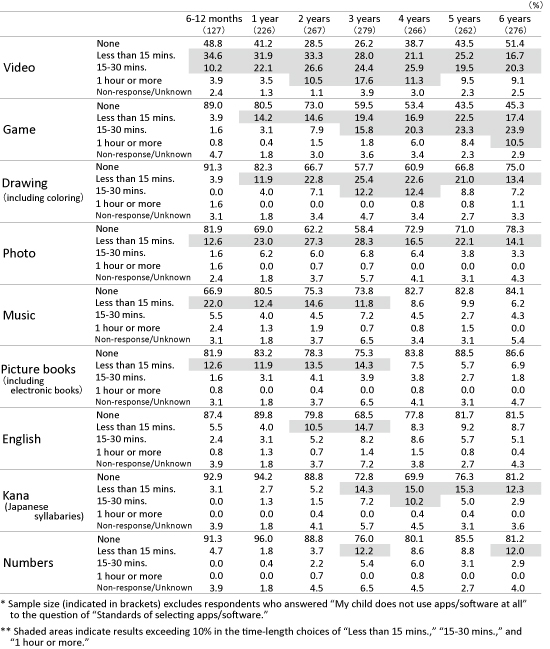 The most popular applications (apps) and software used by young children on weekdays at home in descending order of the amount of time spent on each activity are "video," "game," "drawing," and "photo." "Video" gets the longest periods of use among children aged between 2 and 4 and "game" apps get longer periods of use among the older children. Furthermore, the contents of long-period use shift from "music," "picture books," "English," to "Kana (Japanese syllabaries)," as the children enter higher age groups. The main reasons why parents chose the apps or software were because; The "children themselves like it," "the contents are appropriate for the age of children," and "it satisfies the intentions of parents." What kind of apps or software do young children watch or use daily at home on weekdays? We asked about the time spent in daily use of 9 different types of apps/software. The result (as shown in Figure 1-6-1) indicates that the apps/software used for the longest period is "video," followed by "game," "drawing (including coloring)," and "photo." However, looking at the results to apps/software other than "video," over 60% answered "none." What distinctive features does "video" have then? The daily time-length of "video" use is 38.9% for "none," 26.5% for "15 minutes or less," 11.2% for "about 15 minutes," 11.0% for "about 30 minutes," and 10.0% for "1 hour or more." Although "none" is the majority, it is distinctive that over 10% of children use "video" for both "about 30 minutes" and "1 hour and more," which is a much longer usage period compared to the other types of apps/software. A lot of parents mentioned in the free comment space that their children watch popular children's TV programs or animated songs available on video sites. It seems that video apps are used commonly as they are handy when children want to watch something or parents want them to watch something. Table 1-6-1 shows the results by children's age group. Let's look into the results by focusing on apps/software types which are marked by over 10% in each age group. Over 10% of all the age groups above 1 year-olds use "video," "game," "drawing (including coloring)," and "photo" apps for "15 minutes or less." This indicates that those apps/software are likely to be used among wide age groups. With respect to "video," in all the age groups, children who answered "15 minutes or less" and "between 15 and 30 minutes" respectively reached more than 10%. In particular, usage periods tend to be in longer use among the children aged between 2 and 4, as more than 10% of the children use it daily for "1 hour or more." With respect to "game," the older children got the more they used it; more than 10% of children above age 1 use it for "less than 15 minutes," those above age 3 used it "between 15 and 30 minutes," and those aged 6 use it for "1 hour or more." As for "drawings (including coloring)," more than 10% of children aged between 3 and 4 use it for "between 15 and 30 minutes." With respect to apps/software of "music," "picture books (including electronic books)," "English," "Kana (Japanese syllabaries)," and "numbers," they are used among certain age groups depending on the type of app/software. As for "music" and "picture book (including electronic books)," over 10% of children from the age groups between 6 and 12 months to 3 years respectively use them for "less than 15 minutes" and those aged between 2 and 3 years use "English" for "less than 15 minutes." More than 10% of children from the age groups between 3 and 6 respectively use "Kana (Japanese syllabaries)" for "less than 15 minutes" and over 10% of those aged 4 use it for "between 15 and 30 minutes." There is no specific tendency observed in the use of apps/software of "numbers." The result indicates that "music" and "picture books (including electronic books)" are likely to be used by younger children, "English" for those aged between 2 and 3, and "Kana (Japanese syllabaries)" for older age groups. It seems that the usage by contents depending on the children's age shifts from one to another reflecting the change in children's interests and parent's intentions for their children by age. 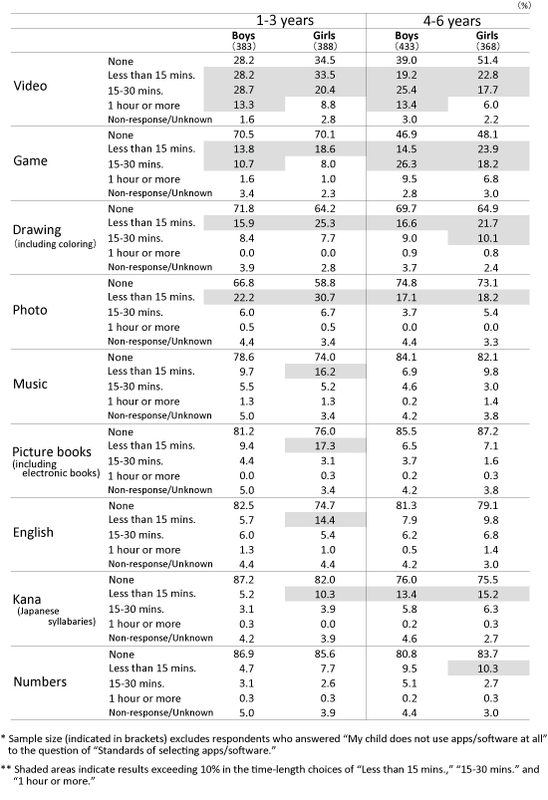 Table 1-6-2 shows the daily time-length of apps/software use at home on weekdays by children's age and gender. Looking into the categories of apps/software which are marked at more than 10%, boys are likely to use "video" and "game" for longer periods. With respect to "video," as for those aged between 1 to 3 years, 28.7% of the boys as opposed to 20.4% of the girls use it for "between 15 and 30 minutes," while 13.3% of boys as opposed to 8.8% of the girls use it for "1 hour or more." Between the age of 4 and 6, 25.4% of the boys as opposed to 17.7% of the girls use it for "between 15 and 30 minutes" while 13.4% of boys as opposed to 6.0% of girls use it for "1 hour or more." Boys use it for longer periods than girls in both age groups of 1-3 and 4-6. With respect to "game," among those aged between 1 and 3, 10.7% of the boys as opposed to 8.0% of the girls, and for those aged between 4 and 6, 26.3% of the boys as opposed to 18.2% of the girls use it for "between 15 and 30 minutes." 9.5% of the boys as opposed to 6.8% of the girls in this group use it for "1 hour or more." Boys tend to use "game" apps/software for slightly longer periods than girls. In contrast, girls use "drawing (including coloring)" and "photo" apps/software for longer periods than boys. Furthermore, the following apps/software all had higher scores marked among girls aged between 1 and 3 using the apps/software for "less than 15 minutes"; "music" (boys 9.7% < girls 16.2%), "picture book (including electronic books)" (boys 9.4% < girls 17.3%), "English" (boys 5.7% < girls 14.4%), and "Kana (Japanese syllabaries)" (boys 5.2% < girls 10.3%). Is there any distinctive difference according to children's age and enrollment/type of preschool? 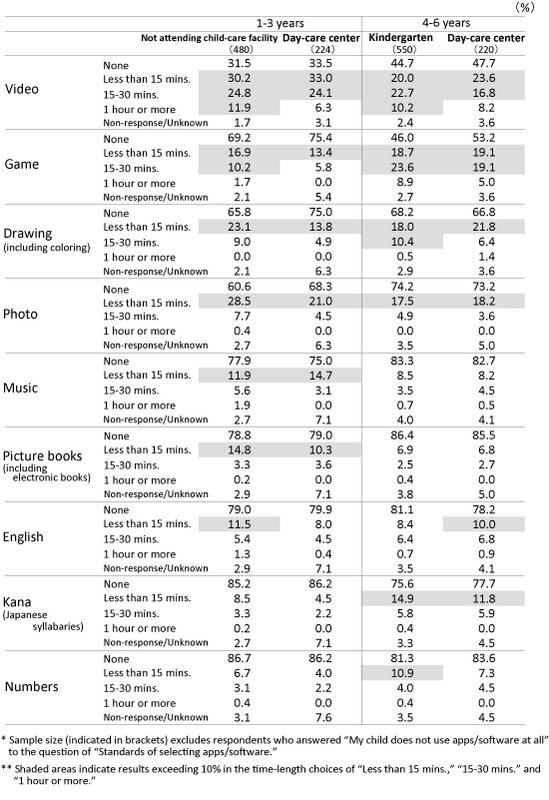 The results shown in Table 1-6-3 indicates that there are clear distinctions seen only among the apps/software used for longer periods in general such as "video," "game," "drawing (including coloring)," and "photo." There are hardly any differences between "music," "picture books (including electronic books)," "English," "Kana (Japanese syllabaries)," or "numbers." Looking into the details of the items which show clear differences, as for "video," among children aged between 1 to 3, 11.9% of children not attending any child-care facilities as opposed to 6.3% of children who attend day-care centers use it for "1 hour or more." Among those aged between 4 to 6, 22.7% of children who attend kindergarten as opposed to 16.8% of those attending day-care centers use it for "between 15 and 30 minutes," and 10.2% of those attending kindergarten as opposed to 8.2% of those attending day-care centers use it for "1 hour or more." With respect to "games," among those aged between 1 and 3, 10.2% of children not attending any child-care facilities as opposed to 5.8% of those attending day-care centers and among children aged between 4 and 6, 23.6% of those attending kindergarten as opposed to 19.1% of those attending day-care centers use "game" for "less than 15 minutes." As for "drawings (including coloring)," among those aged between 1 and 3, 23.1% of children not attending any child-care facilities as opposed to 13.8% of those attending day-care centers spend "less than 15 minutes" and 9.0% of children not attending any child-care facilities as opposed to 4.9% of those attending day-care centers use it for "between 15 and 30 minutes." When it comes to those aged between 4 and 6, 10.4% of those attending kindergarten as opposed to 6.4% of those attending child-care centers use "drawing" apps/software for "between 15 and 30 minutes." With respect to "photo" apps/software, children not attending any child-care facilities aged between 1 and 3 use it for longer periods. It is natural that the results indicate children attending kindergarten and not attending any child-care facilities spend more time with the apps/software than those who attend day-care center as they stay longer at home, since the questionnaire specifically asked about apps use at home. On the other hand, there is hardly any difference among children's age or enrollment/type of preschool seen in terms of specialized apps/software such as "music," "picture books (including electronic books)," "English," "Kana (Japanese syllabaries)," and "numbers." Regardless of their enrollment/type of preschool, the results show that children make use the of apps/software according to their own individual purposes. Apps/software are chosen because "children like it," "the contents are appropriate for the age of children" and "it satisfies the intentions of parents"
According to which criteria do parents choose apps/software for their children to use or watch frequently? The result (as shown in Figure 1-6-2) indicates as follows: which are in descending order of the total proportion of answers matching "apply" and "apply to some extent"; 84.6% matching "children themselves like it," 82.5% matching "the contents are appropriate for the age of children," and 60.0% matching "it satisfies the intentions of parents". The percentages of other answers apart from those mentioned above are all around 20% which are relatively low; 22.3% for "can trust apps/software maker," 21.2% for "there is advice for children on how to use it," and 19.2% for "there is explanation for parents about the aim of apps/software." If we look into the percentages of "apply" (not to some extent) for these answers, none of them reached even 10%. It is likely that parents will consider how their children react to apps/software first such as "children themselves like it" or not and whether "the contents are appropriate for the age of children" or not when they select the apps/software for their children. Then they seem to check whether the contents satisfy the intentions of parents or not. However, it seems that there are very few parents who have an interest in whether the apps/software maker is trustworthy or not or whether there is an explanation about how to use it or the aim of products for children and parents indicating that there seems to be still fewer parents who thoroughly check whether the app/software is suitable for their children or not. 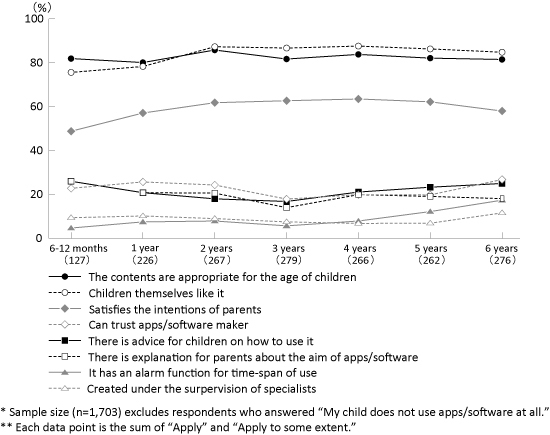 Figure 1-6-3 shows the percentage of the applicable standards of selecting apps/software by children's age. "Children themselves like it" and "the contents are appropriate for the age of children" show high percentages among all the age groups of children. More than 60% of parents of the respective age groups between age 2 and 5 answered that "it satisfies the intentions of parents." It seems that, no matter what age group children are, parents choose the apps/software according to how their children react to it first. Once the children reach the age of 2 and above, the intention of parents seem to enter the standards of the selection. The percentage marking "it has an alarm function for time-span of use" increased among the parents of children aged 5 and 6. As children grow older, their attention span naturally becomes longer. In particular, as the time-length of "games" use tends to be longer among the children aged between 5 and 6 (as shown in Table 1-6-1), the parents indicate a preference for an alarm function to warn of excessive use.